Argentina captain, Lionel Messi, has been banned by FIFA for four games, over a foul-mouthed rant at a match official. The decision was communicated to the Argentine Football Association, just six hours before their 2018 World Cup qualifier against Bolivia today. 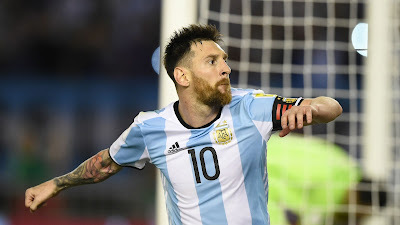 The incident happened during the Albiceleste’s 1-0 win over Chile, in which Messi scored the winning goal from the penalty spot. The Barcelona superstar was adjudged to have used abusive language towards an assistant referee during the match. Messi has been fined 10,000 Swiss francs (£8,100) and will also miss World Cup qualifiers against Uruguay, Venezuela and Peru. The next game he will be available for, is the final match against Ecuador. “This decision reflects the consistent case law that the FIFA Disciplinary Committee has applied in previous and similar cases,” a FIFA statement reads. Four South American teams are guaranteed a place at the World Cup. A fifth country can also progress, by winning an intercontinental play-off tie against a team from Oceania. Argentina are currently third in the regional table, two points ahead of Chile.